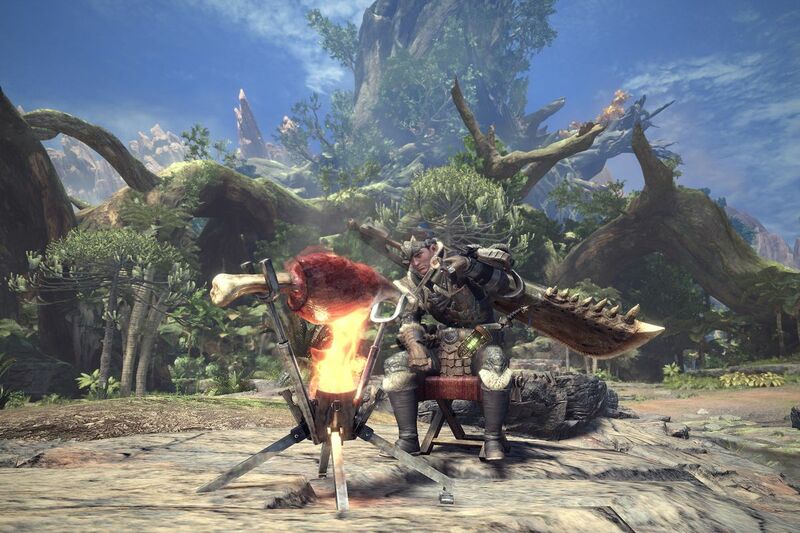 Monster Hunter World has been out for a couple of weeks now, and every fan of the franchise has most likely bought it and is playing through it. Since there are many players out there that may be interested in the game but have no experience with the franchise, I wrote this preview with new players in mind. And while I still haven’t beat the game yet, I’ll write a full review once I do. Once a monster has low life they may escape and go to sleep, while others may hunt a smaller monster to eat. All these details provide the unique feeling that these are living creatures that we’re hunting, and by playing the game we are studying and learning everything about them. But this wouldn’t matter if the game was unplayable, but luckily that’s not the case. Being an action-RPG, the game has a focus on active combat against the monsters. You can roll, run and some weapons allow you to block incoming attacks. But timing is everything in Monster Hunter, and learning to read the monster’s movements will help you survive longer. This is not the type of game in which you have to do 100 hit combos, instead the game asks you to go slowly, read your opponent, and attack carefully. It may seem hard at first, but once you get it, combat is really rewarding. Since there’s no way to cheat the system by leveling up past the enemy or getting better weapons, you will become a better player after each fight. As in past entries, there is a simple story that will guide you through the tutorials of the game and give a purpose to the adventure. The protagonist, which can be customized with an amazing character creator, is part of the Fifth Fleet that is traveling to a new continent to investigate a giant monster that crosses the ocean every 10 years. 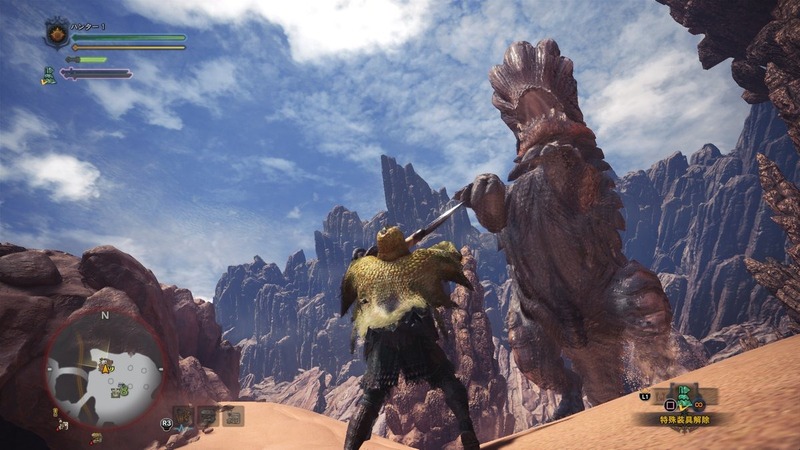 While at first we will do smaller quests like exploring the area or hunting some aggressive monster, eventually we will find out how this giant monster is involved with everything in this new world. But what brings so many fans to the series is not the plot, but the addictive cycle of progress in it. 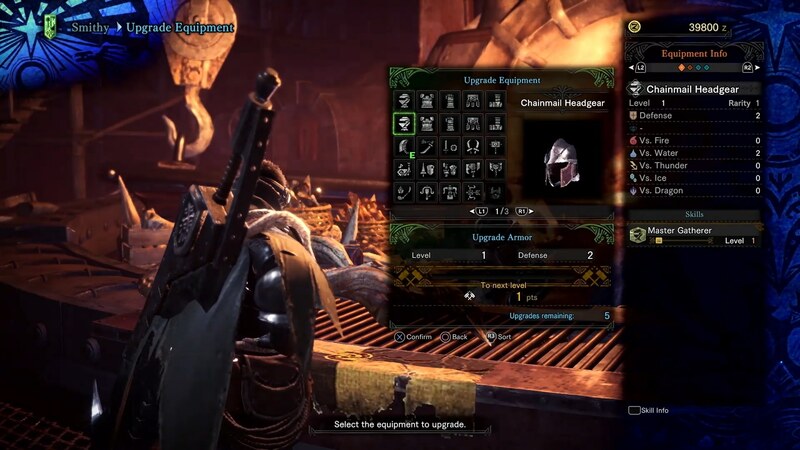 Defeating a monster will give you pieces of it, like claws, scales, hides and horns, and by combining these pieces with other materials at the smithy you can craft new armor and weapons. Since there are no levels in Monster Hunter and the armor that they sell you is mediocre, the only way to stand against stronger monsters is by constantly crafting new equipment. But by just killing a creature once you won’t have all the parts needed to craft all the pieces of armor, divided into Head, Body, Arms, Legs and Skirt, so you will have to kill the monster several times. And this is the part where your new knowledge of the creature enters. The first time you’re against a new monster you’re a newbie and it will be hard. The second time you can anticipate some of its moves. By the third they barely hit you. And once you finish crafting the armor you’re so familiar with the monster that you’ll want to fight it again just for the thrill of it. 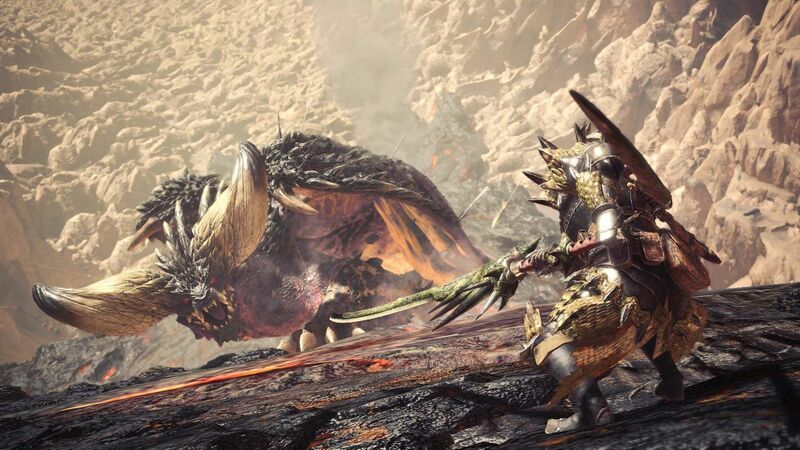 Fighting monsters and upgrading your armor so you can fight even stronger monsters has always been the hook in Monster Hunter, and while you may think this is as tedious as farming items in a MMO, the truth is that the combat is so good that it’s a lot of fun. Add this to hunting with 3 other players and it makes this a great game to play with friends or meet new ones in. I mentioned at the start that I haven’t finished the game yet, and the reason for that is because there are lot of things to do. While you can buy some potions at your base, it’s cheaper to craft your own items, and to do so you have to collect herbs, bugs, honey, mushrooms and many other resources on each map. You can also craft traps to use against the monster, bombs or other tools that can help you deal additional damage. In addition there are different facilities in town that can be upgraded by completing side quests that range from collecting mushrooms, killing small monsters, or even capturing large ones. All of these should give you an idea of what to expect from Monster Hunter World. However you may be thinking that this game is considered quite difficult by many people online, so let’s discuss this next. I’ve played Monster Hunter 4 Ultimate on 3DS and Monster Hunter Trii on Wii and I feel this is the easiest and most welcoming Monster Hunter yet. The game starts really slow. It shows you a quick tutorial every time anything new is introduced and the first monsters you fight against are all very easy. At certain points of the story it will present a new challenge that will definitely make you rethink your strategy, but it will always present you with the tools to overcome them. And if everything else fails, you can use a SOS flare to ask for help from every player around the world. So if you can’t defeat a monster by yourself let some strangers help you, the Monster Hunter Community is one of the most welcoming I’ve seen. This game has many mechanics, some which may feel overwhelming at first, but you don’t need to learn them all from the start. 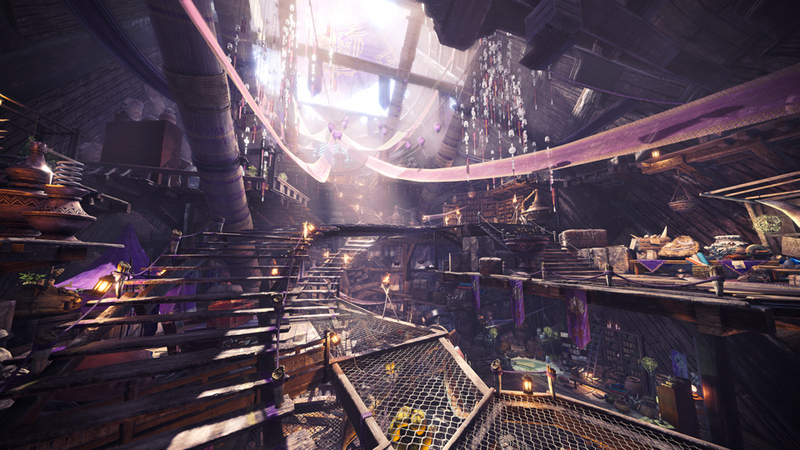 The game is designed in a way that you can explore by yourself all these mechanics at your own pace, which is why this feels like the best time to jump into Monster Hunter. Graphically this game is beautiful. Considering that previous entries were on the 3DS the overhaul is obvious, but that’s not all. While you hunt time will flow so you can go on missions during the morning or late at night. The weather also changes and although it doesn’t impact the gameplay, it makes you feel that you’re part of a living world and really pulls you into it. The music is great and so far I’m loving the new tunes for each of the monsters and maps. 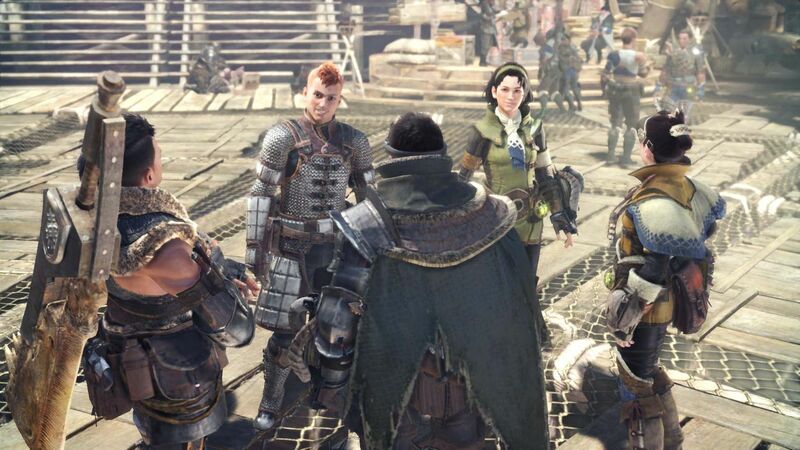 There are a lot of new mechanics introduced in Monster Hunter World related to matchmaking, crafting, hunting, and much more, but I’d prefer to discuss those more in depth in my final review, since I feel that a certain level of familiarity with the game or the series is required and I wanted to keep this more friendly for newcomers. But in short this is by far the best hunting game I have ever played and definitely a strong contender for game of the year. I feel that this is one of those games that everyone should play, it’s really good.